Winter is the definition of the word respite: a brief interval of rest. Even the plants in my veggie garden that I’m still harvesting for dinner aren’t actively growing. I cut the chard, lettuce, cilantro and pak choi knowing that they aren’t likely to regrow. Shrubs, perennials and trees that keep their foliage or semi-evergreen won’t replace what is blown away, winter burned, or otherwise discarded at this time of year. Winter calls on us to look at our landscapes differently. Since we can’t be seduced by flowers, we’re more appreciative of foliage, form, and sheer staying power. We’re more able and willing to appreciate subtlety and nuance. Today the rain falls on my garden and my attention is caught by how the landscape is being revived at the same time it is resting. This moisture is a gift for the plants even, or perhaps especially, in winter dormancy. For humans the two go hand in hand, so why not for plants too? The conditions that allow us to rest also permit us to be transformed and renewed. In temperate zones such as the Northeast, plants have no choice but to enter this dormant period. People, however, are able to defy the seasons…we have electric lights to prolong dark days and central heating to warm cold temperatures. We may be better off for surrendering to interludes of respite and rejuvenation, but first we must recognize and embrace the wisdom of doing so. How do you build periods of rest and reconstruction into your life? How might you facilitate your rejuvenation this winter? 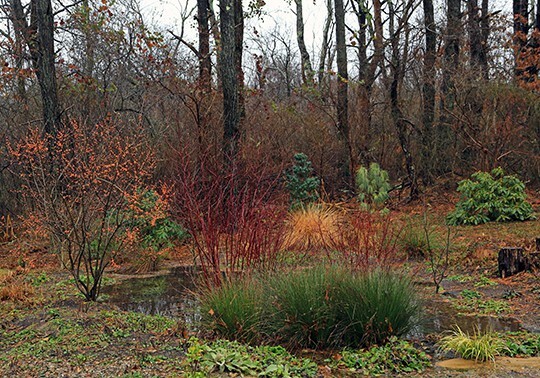 The rain garden is filled with plants that remain stylish while they are at rest.